If you've decided to protect your business with CCTV surveillance cameras, you may be tempted to simply buy a cheap system online and put it up in the office yourself. However, it's a far better idea to contact a professional security installer and ask them to undertake a survey of your site - this will enable them to offer their expert opinion and recommend a CCTV system that is perfectly tailored to your requirements. They will also be able to install your new security cameras in such a way as to minimise blind spots and provide the best possible coverage of your premises. All of the above services are available from IDS Security Systems Ltd. Based in Cardiff but serving clients throughout South Wales and beyond, we employ a team of experience security camera installers who have worked in a wide range of different business premises, including shops, offices, factories, warehouses and more. We'll send a security specialist to visit your site, conduct a full survey, and recommend the right security system for your business. We can also supply your state-of-the-art security cameras, take care of the installation, and even service them if you take out a maintenance contract with us. 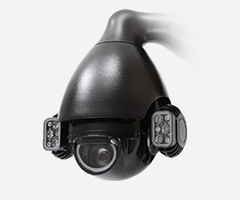 Contact IDS Cardiff today to request a quotation for your security camera installation needs. If you're thinking of investing in a surveillance system to protect your property, then it's important to ensure that this is accurately tailored to your individual needs, and provides reliability for years to come. Here at IDS Security, we've been operating throughout Cardiff and South Wales for over two decades, which means that we have a wealth of experience in installing surveillance systems for a wide variety of clients. Over the years we've provided CCTV systems for clients of all sizes, from homeowners to large businesses and public bodies; all with their own, very particular set of requirements. Because of our knowledge and experience, combined with a commitment to using the latest technology, we are able to provide surveillance systems that deliver both security and flexibility to our clients. Whether it's a stand-alone CCTV project, or a combination of surveillance systems with access control and intruder alarms, we can ensure that your installation performs to the highest possible standard. If you live or work in South Wales, and would like to find out more about investing in a surveillance system for your property, then get in touch with IDS today! Give us a call on 02920 753 251, or fill out our simple enquiry form here.